Penny Johnson is an award-winning watercolorist born and raised in Ohio where her desire for art evolved. Since 1996 the mountains of Western North Carolina have been home to her and her husband. Penny loves spending time painting, gardening, volunteering and with her pets. She enjoys painting a variety of subject matter. 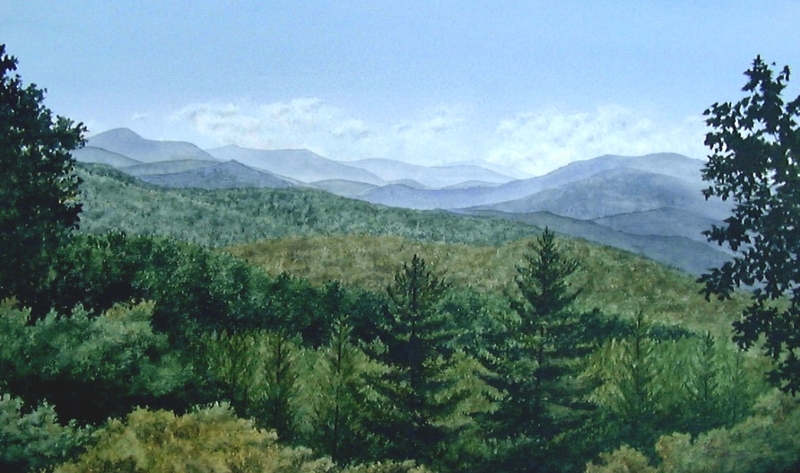 Her favorites include landscapes of the Appalachian mountain area and portraits, both human and animal. The artists’ paintings can be seen in private collections in the United States and in Europe. Penny is a signature member of The Watercolor Society of North Carolina and The Georgia Watercolor Society. In addition she is a member of The Blue Ridge Mountain Arts Association, The Southern Appalachian Artist Guild, The Cherokee County Arts Council, and The Valley River Arts Guild . Penny is available for commissioned paintings of your favorite view, pet, or person.